Stephen Bailey is one of the hardest working front-of-house engineers in both the house of worship and mainstream markets, lending his mixing talents to such artists as Matt Redman, Charlie Hall and Kristian Stanfill. In this exclusive interview, Stephen tells us about his favorite Waves plugins and how he uses them. Which console(s) do you use? Which live mixing challenges do you feel are unique to the HOW environment? It can be challenging to take all the different program elements in a HOW setting (bands, video playback, headset mics, etc.) and make it all flow together in a well-balanced program with minimized distractions. How do you approach your mix in the HOW setting? Before the service, I try to factor in a few variables, such as the demographic of the gathering, the room and what the PA is capable of. If it's a 9 AM service with an older crowd, we aren't going to run the PA at 100+ dB. I think having good discernment is extremely important. What is your goal for your mix in a service? To sound great and have a big impact, but ultimately to reinforce what is happening on stage and in the room, with no distractions. What opportunities and challenges do you feel are unique to your work as an FOH in an HOW? In my opinion, FOH in this setting can definitely be one of the most challenging, but also one of the most rewarding. You have to be very alert to what is going on, for example, if someone randomly walks on stage with a hand held or headset mic, making sure that mic is on and at the right level before they start speaking. Also, feedback can be a common battle for any FOH engineer in the church world. Until someone invents super high gain before feedback/ambient noise rejection headset mics that actually work, we can just stick to Waves WNS! What advantages are there to using plugins in addition to the processors that come with the desk? I like to consider standard desk processing as a utility. You obviously need equalization, filters and standard dynamics processing, but when you load up Waves, you immediately take a massive step up in sound quality and versatility. Even with a few plugins, I can get any input to sound ten times better and even get sounds that aren't possible with onboard processing – in half the time. 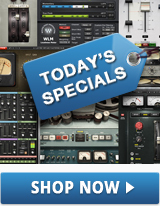 CLA Classic Compressors, C4 Multiband Compressor, Renaissance Reverb, and H-Delay. Which plugins do you use for vocals? Depending on what the vocal sounds like, I will use one of the four models of the CLA compressors. They add something that "utility" compression can't. Especially with dynamic choirs, the C4 does wonders. I've found it can start to sound a little funky when I have to put more than around +/- 5 dB of EQ on choir mics, so instead I will just use C4 and compress problem bands – typically high-mids. How do you control lead vocals using Waves plugins? If there is a tough vocal to mix, I will use C4 to try to balance it out without changing the tonality too much by only using EQ. Do you use any plugins on the main mix bus? Yes. I am a fan of using a touch of L2 to bring out some subtleties and filling out the mix. Sometimes I'll put C4 on the master bus with a high threshold and hard knee, just in case something starts getting out of hand. Describe your signal chain, from the stage mics out to the FOH speakers. What is your favorite Waves "problem-solver"? C4. One of the most versatile plugs I've ever used. Do you record or virtually sound-check the services? There used to be more of a distinction between live and studio engineers. Do you find that, today, more engineers do both? I do think that studio guys will float over to see what the live world is like and vice versa, but I think that eventually your personality will help dictate which world you gravitate to. Other than the mixing part, they are vastly different worlds. What advice would you give to Tech or Audio Directors who want to move to digital? I think it would be a very wise option, especially for a church that has multiple engineers or different volunteers each week. With digital, the options are close to endless.